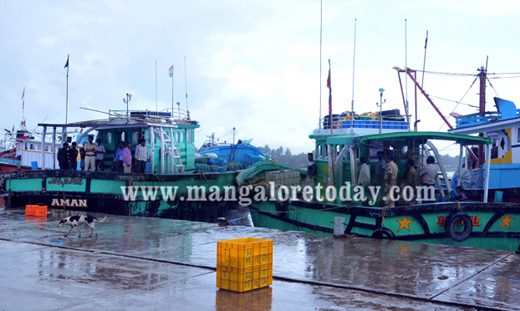 Mangaluru, Jun 11 2016: In a joint operation conducted by Coast Guard and Coastal Security Police Force, two boats which were engaged in fishing activity near Panambur in violation of ban orders, were confiscated on Friday June 10. 22 fishermen found in these two boats were taken into custody. They were fined Rs 3.5 lac. After getting information that two Tamil Nadu-based mechanized boats were conducting fishing ten nautical miles off Panambur coast in Arabian sea, both the above forces jointly went into action. 22 fishermen found in these two fishing boats and the fish catches were taken into custody by the police They were handed over to the deputy director in the department of fisheries for further action. The deputy director of fisheries imposed a fine of Rs 3.5 lac on the boats for this violation. The fish catch was auctioned for Rs 1 lac. The boats and the fishermen would be released after payment of the said fine, the officer said. According to sources, the coastal security guards seized two boats and handed over 22 persons were to the coastal security police.